With 30 Day Warranty, Low Transport Fee, Fair Prices, Quick Repair At Your Place. Same Day. On The Spot. Looking for help with your refrigerator, freezer or chiller? We are the right choice for you. Our experienced fridge repair specialists offer unparalleled repair solutions at an excellent price. In our hot and humid climate, not having a working fridge can only end in having to toss away meat and vegetables that spoilt. That's why we have parts ready in our service vehicles to complete all fridge repairs on the spot, in one appointment. The whole process is really simple; you give us a call, and we make your fridge cold again. Knowing the urgency of most cases, we've built ourselves in a way that allows us to dispatch our fridge repair specialists to your location and get your fridge fixed today. 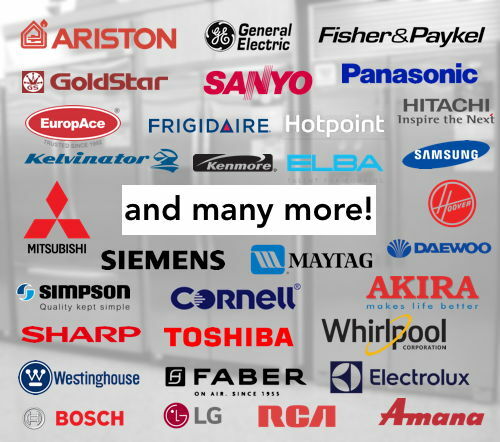 We have the capacity to solve refrigerator issues for any brand, as long as we have the parts in stock. Our technicians undergo continous training and improvement. Our specialists will explain the problem and let you know what needs fixing so you can make an informed decision. We don't wish to waste your time or money. Our fridge repair specialists are available to you, your family and friends all year round. Call us anytime between 8am to 10pm, and we'll make your fridge cold again. Very quick service! Technician showed up less than 30 min after I called even though it was a Sunday. He was patient and knowledgable. Very satisfied with their outstanding service! My refrigerator was not cold so I called them. Call operator was very friendly and helped me to arrange an appointment. The technician arrived promptly and the fees were reasonable. They were very quick to respond and professional with their jobs. The whole repair was done at my home and completed in less than one hour! They exceeded all my expectations! Should Repair Your Fridge Or Replace Your Fridge? A new refrigerator can be expensive, which means the last thing you want to do is purchase another one. Sometimes, however, repairing it might not be the best option. An older unit that has undergone multiple repairs should probably be replaced. Other factors to consider include overall investment costs, long-term operating costs, and utility rates. If the official brand warranty on your fridge has expired, manufacturers take weeks to solve any problems. Repairs.sg can provide the exact same services with genuine manufacturer parts on the today on the spot. We’re unlike most fridge brand’s official service centers, as they usually take up to a week to get someone dispatched to your location. We only charge a $30 transport fee on each appointment which is fully waived if any work is done.